Eszter’s Blog » Blog Archive » Can we stop with the pink and the bows already? Can we stop with the pink and the bows already? Shortly after I found the great blog outside the (toy) box, its author decided that she couldn’t maintain it, not right now anyway. I completely understand her decision, but it’s still a bummer. There’s some great writing there about parenting, gender issues, and consumerism, and her voice will be missed. So here’s a post along similar lines inspired by my stroll down 5th Avenue in Manhattan yesterday. One could probably write a whole book about the experience on that one street Christmas Eve, but I’ll just restrict myself to the NBA store. I’m more of a college basketball fan than an NBA fan, but I like basketball enough in general to have been intrigued by the store and so I went inside. (Yeah, clearly this isn’t a generic anti-consumerist post.) There’s tons of merchandise likely about any NBA team of interest. Naively one might think that most sports and fan gear could be gender neutral. But no, there is a separate “NBA for her” pink section, because how could a girl or a woman possibly appreciate a green or orange jersey, right? In addition to that pink section, I was really annoyed by the gendering of some playful items. 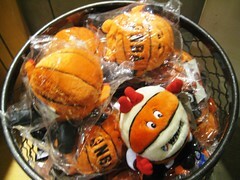 I thought it would be cute to buy a little plush basketball as a gift for a child. 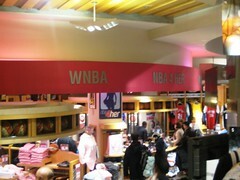 Then I thought: hey, let’s support women’s basketball so I’ll buy the one that says WNBA instead of NBA. But the WNBA balls all had a bow! Why can’t a little plush basketball with two eyes, two hands and two feet not have a bow even if it is supposed to be female? Uhm, and why does something that supports WNBA have to be female anyway? Or would somebody like to critique me for assuming that the bow and big eyelashes are supposed to represent a girl? I find this all so stupid and frustrating. Needless to say I walked out of the store not having spent a penny. This entry was posted on Tuesday, December 25th, 2007 at 12:03 pm	and is filed under Products/Services, Soc/Pol/Econ. You can follow any responses to this entry through the RSS 2.0 feed. Both comments and pings are currently closed. It isn’t any better in Europe. In fact, depending on how you feel about them throwing in a dollop (or is that trollop?) of cheesecake, you could say it’s worse. Interesting commentary, Eszter. I am a fan of auto racing, particularly the Indy Racing League, where we had three female drivers this year. I went to this year’s race at Chicagoland Speedway in Joliet and the merchandise for the female drivers was not feminine, pink, or ribbon-y at all. Though I’m sure you could find some if you looked a bit harder. Racing is a big advertising machine in reality. Apparently the marketers realised they would be missing out on half the market if all the Danica Patrick and Sarah Fisher t-shirts were pink. There is a company that specifically sells girl-themed racing items, but the majority of women interested in racing buy the same stuff as the guys. So racing panders to women just as much as any other sport, but I think racing fans are less willing to give in to it. That’s interesting about racing. I don’t know that world much and it’s interesting to know that in that realm while marketers have tried this, they don’t seem to succeed much.